If you won't believe anything we say, hopefully you'll believe past guests! IMPORTANT! Avoid paying a 15% commission to sites like Booking.com, Expedia, and HostelWorld. 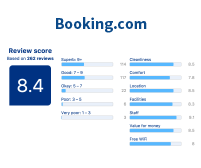 Get the best rates by booking at squamishhostel.com after reading the reviews (if they don't scare you away). Save yourself the time looking for them!